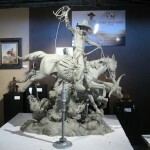 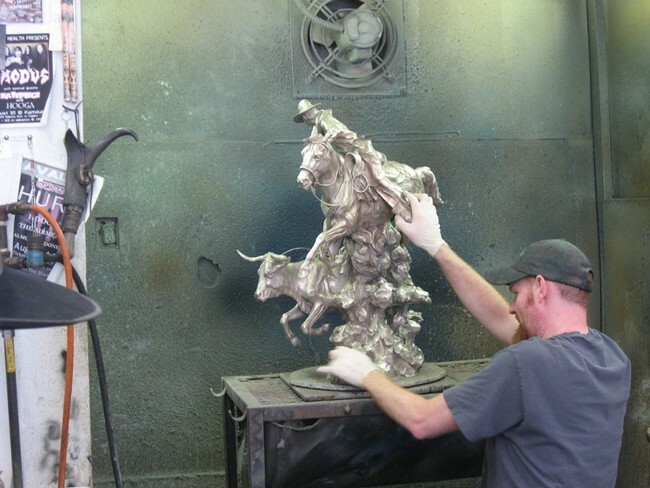 Original is sculpted using and oil base clay specifically designed for the lost wax casting process. 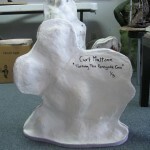 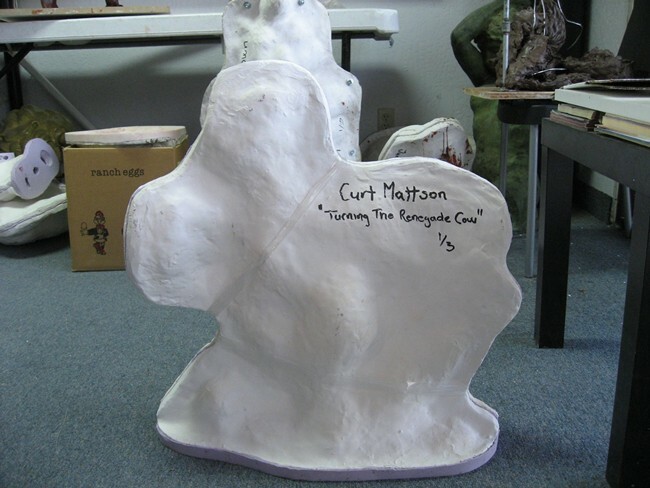 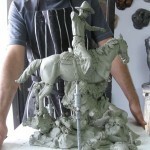 The original clay after the mold has been made. 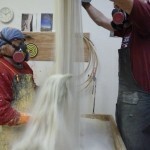 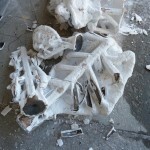 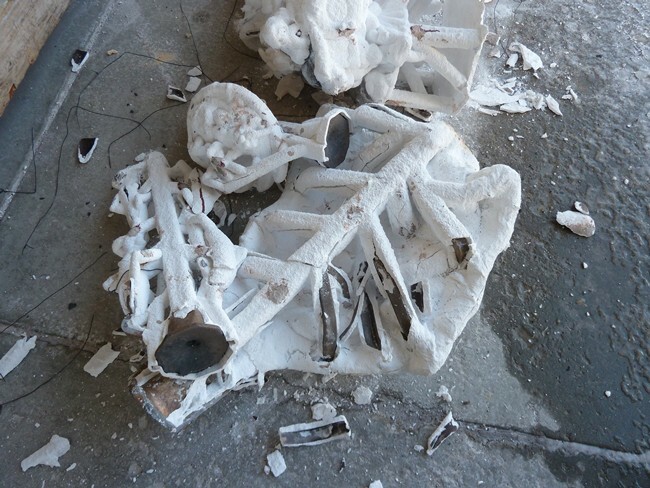 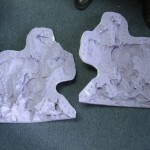 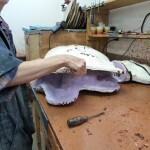 The mold is supported on the outside by a plaster backing or a fiberglass backing. 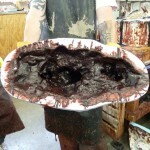 The inside of the mold. 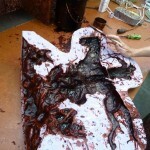 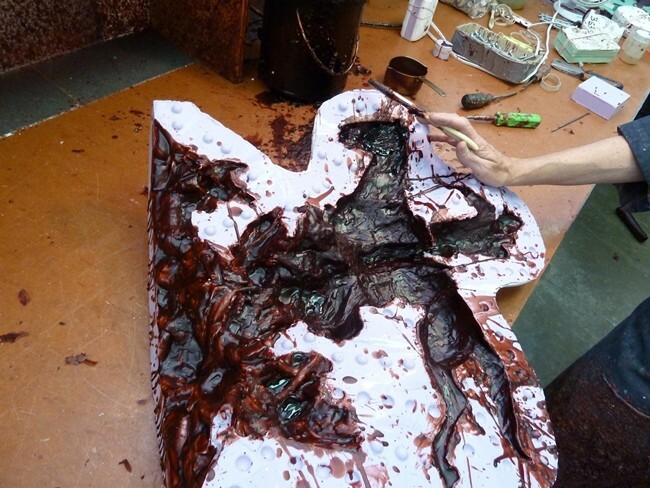 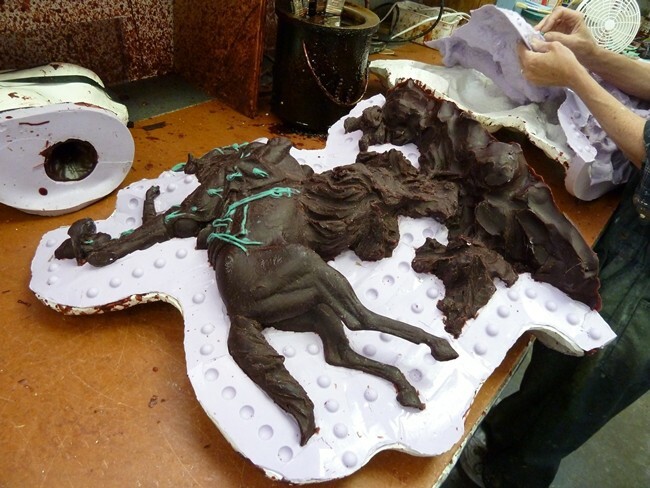 The mold is made by painting on layers of a silicone rubber product. 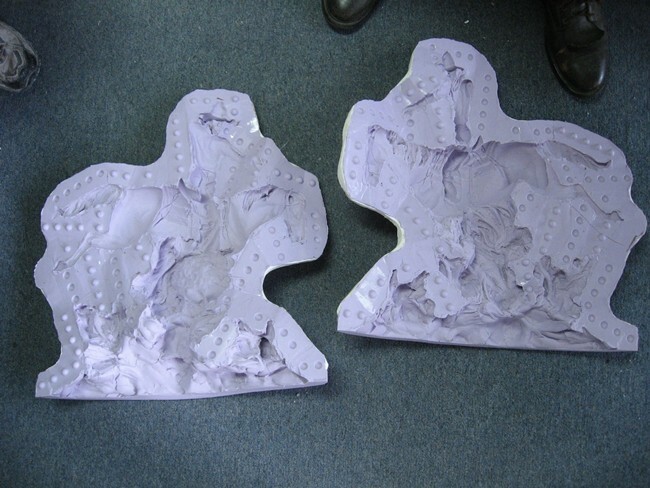 Parts mold. 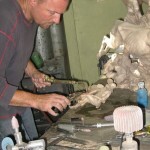 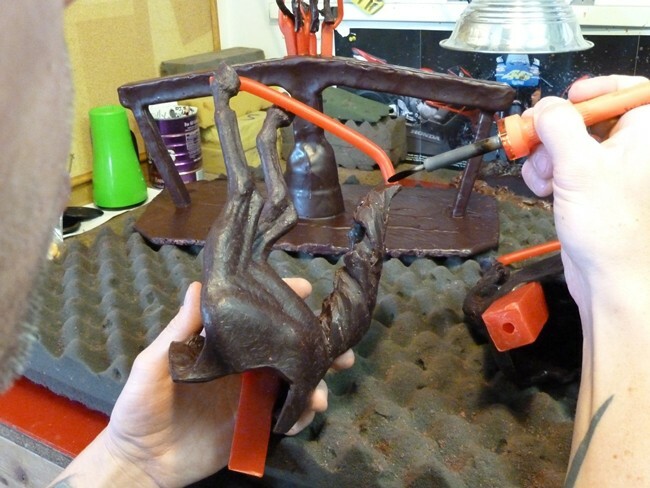 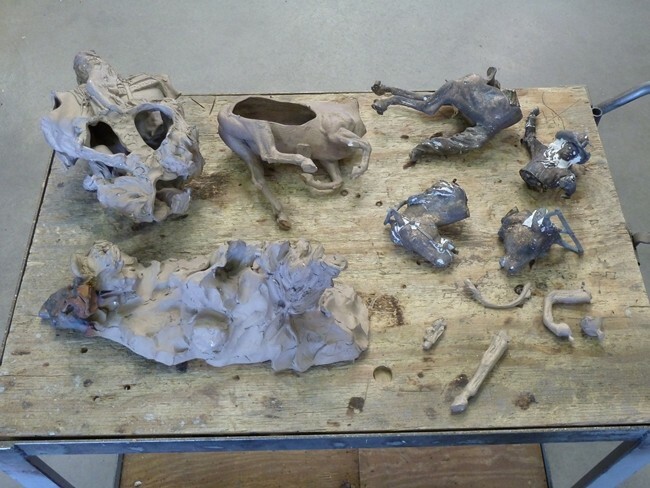 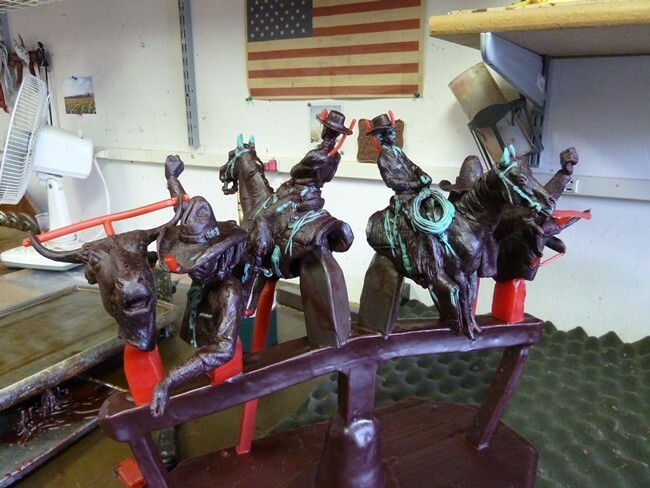 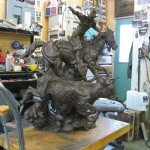 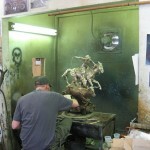 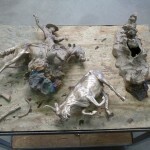 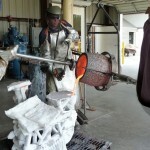 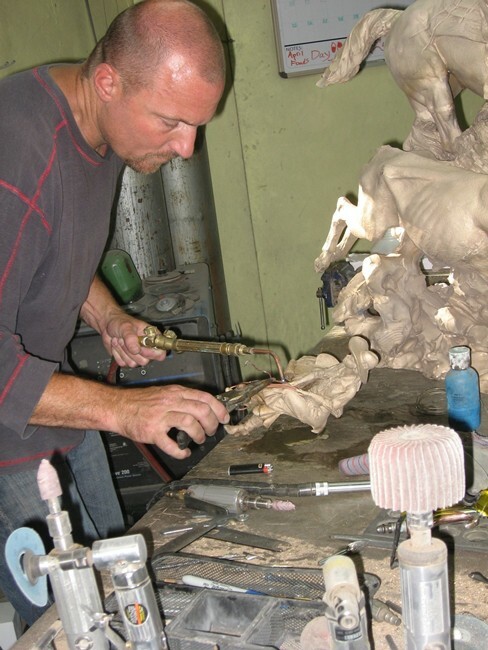 The mold is used every time a bronze is cast. 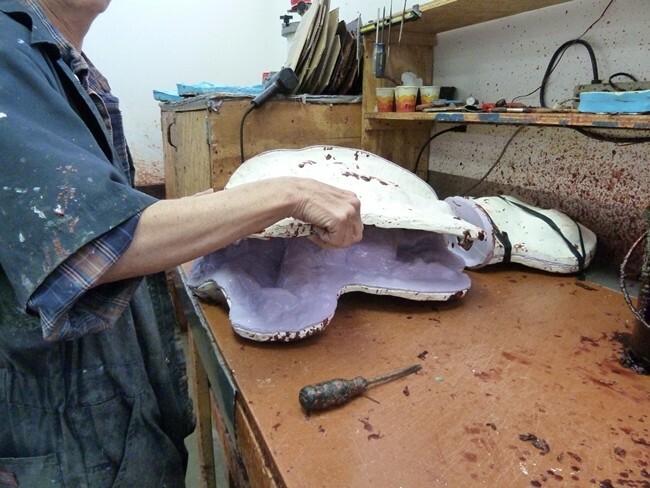 The first layer of wax is a very thin layer which is painted onto the mold. 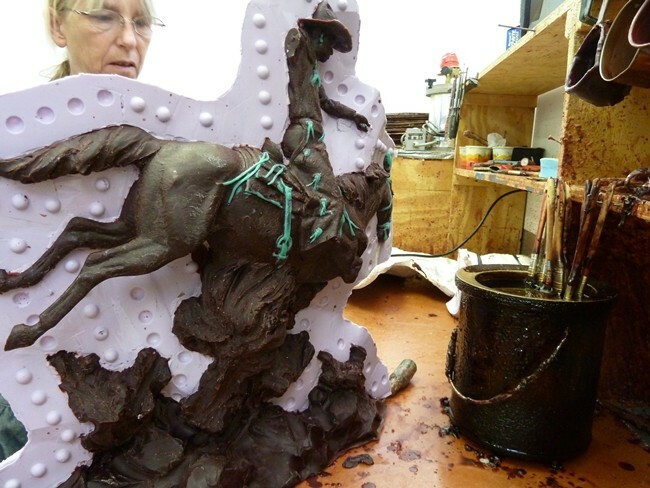 Hot wax is poured into the mold. 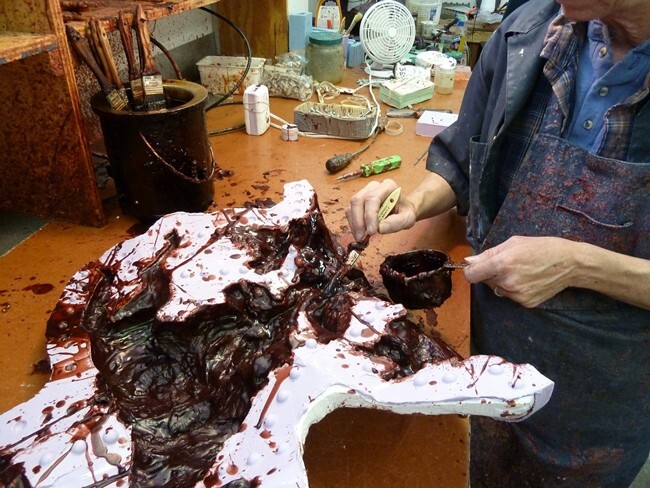 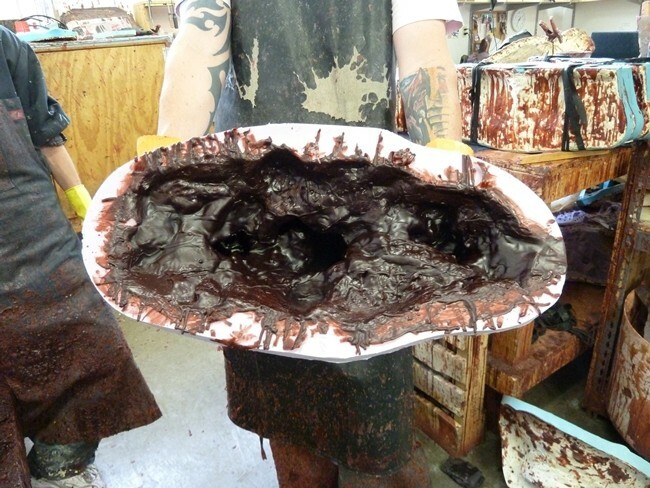 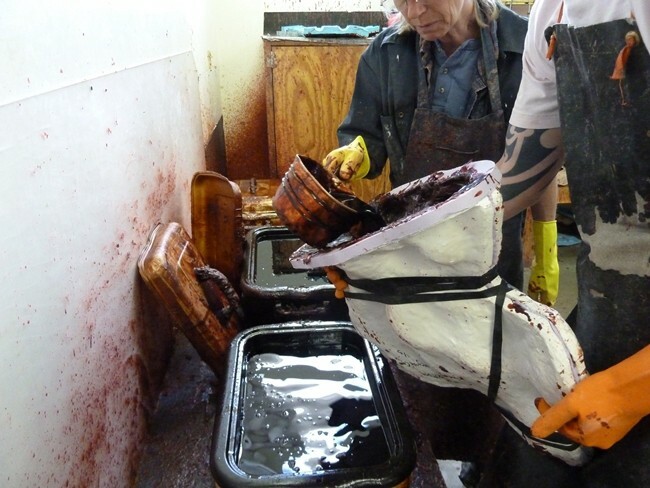 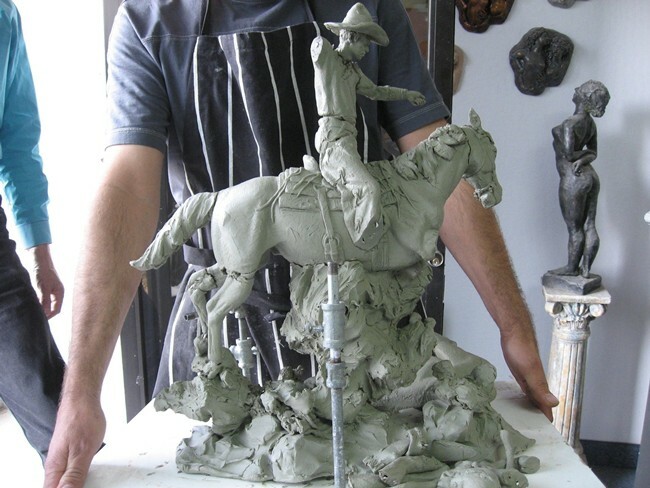 The excess wax is poured out to create a hollow copy of the original clay. 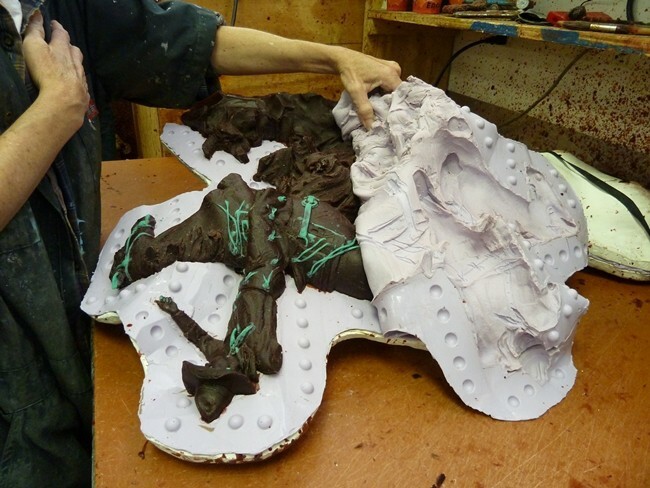 After the wax is cooled then it is removed from the mold. 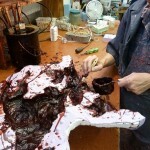 Removing the wax from the mold. 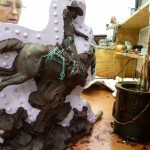 Removing the wax from the mold. 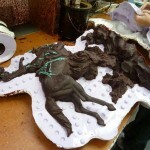 The green is also a wax just a different type to catch all the detail. 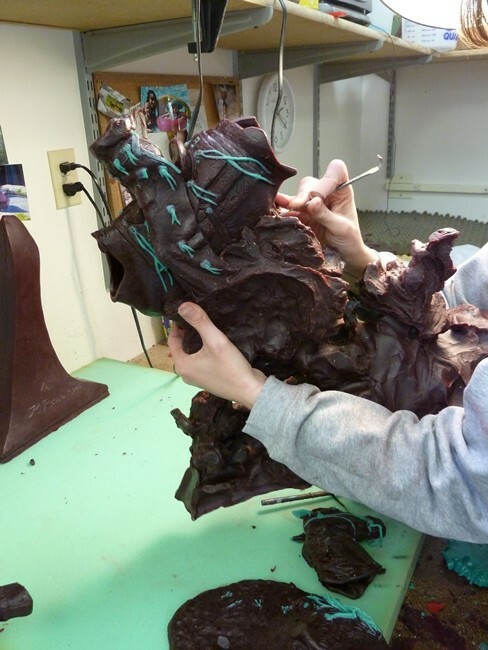 Retouching the wax involves removing the seam lines, scratches or other marks not sculpted by the artist. 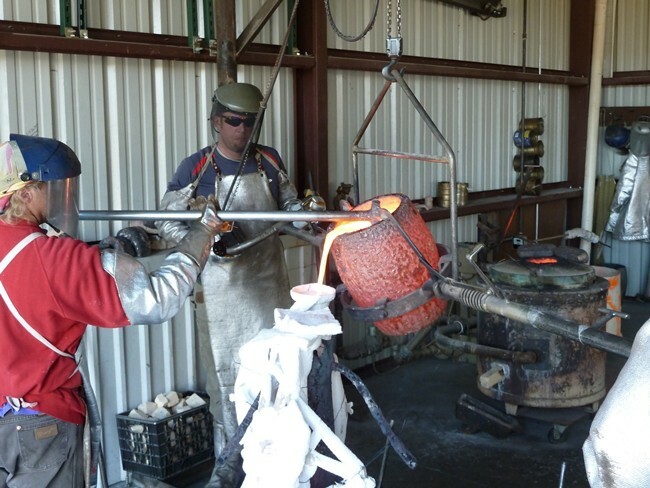 Gating the wax involves adding wax gates which are tubes like a straw and funnels in key locations so the gases can escape when the bronze is poured. 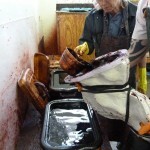 Patches are also cut into the wax to allow the slurry to go inside the piece. 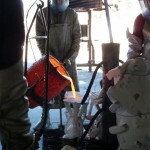 The wax gating is critical to a successful pour. 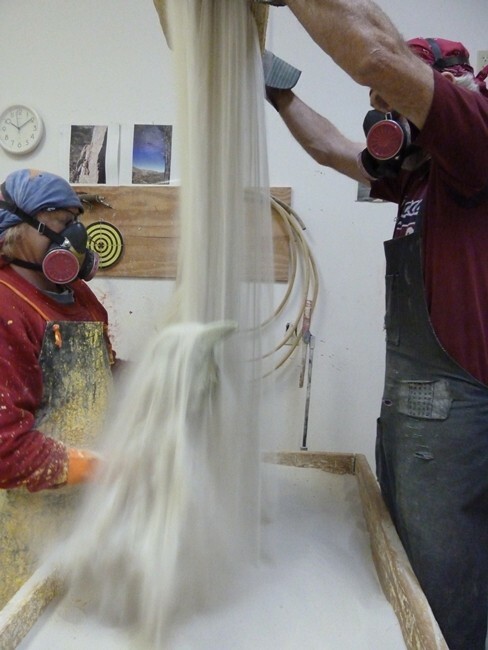 hard ceramic shell is then built around the waxes by dipping the wax in the slurry which is a liquid ceramic silica-sand mixture. 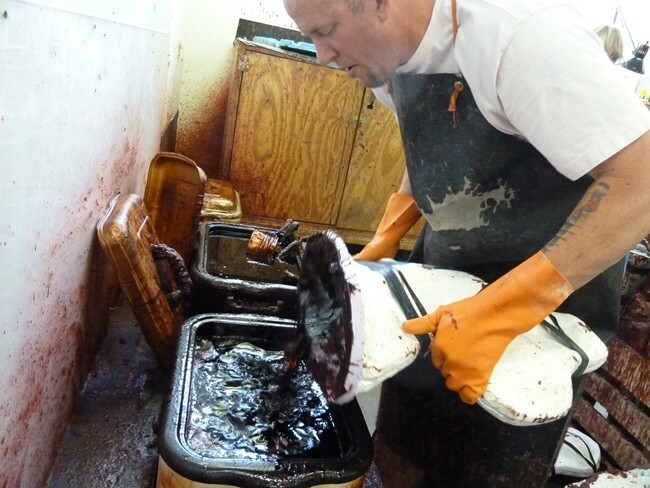 This takes many dips over several days. 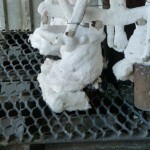 Lost Wax step. 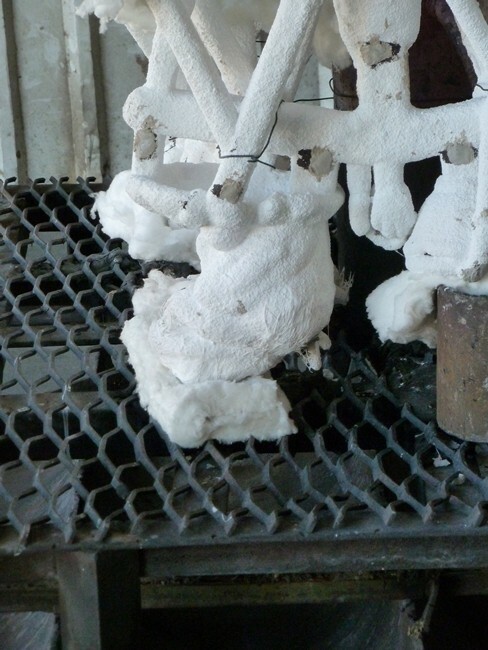 The ceramic shells once totally dry are placed in a type of oven and the wax is melted out. 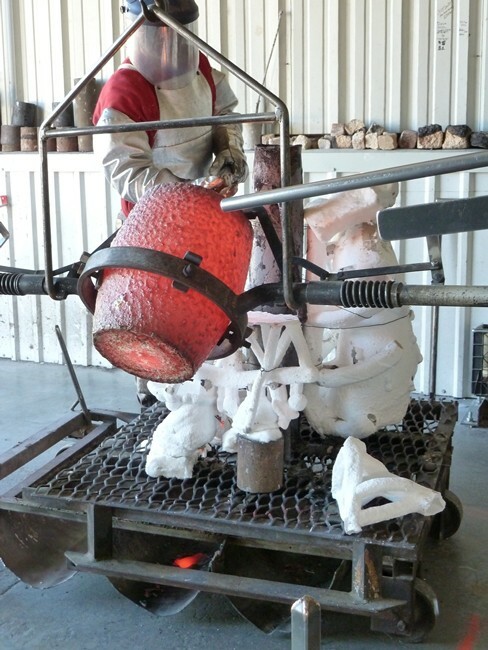 The shells are then cured so then can handle the heat of the molten bronze. 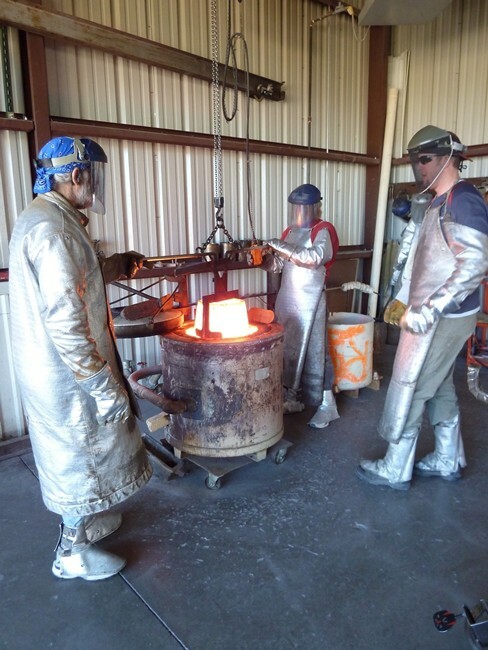 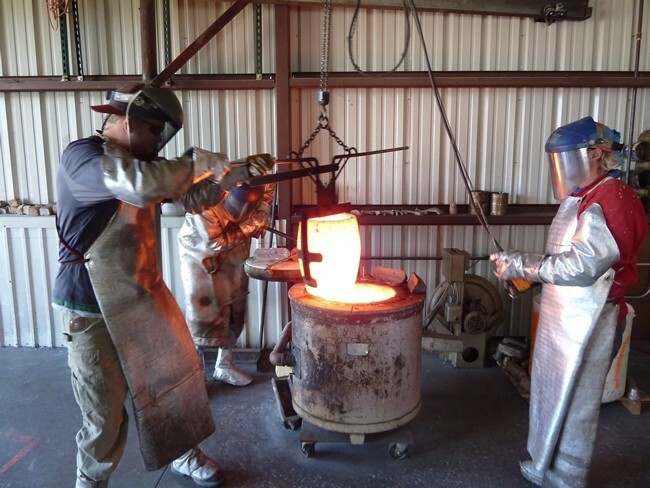 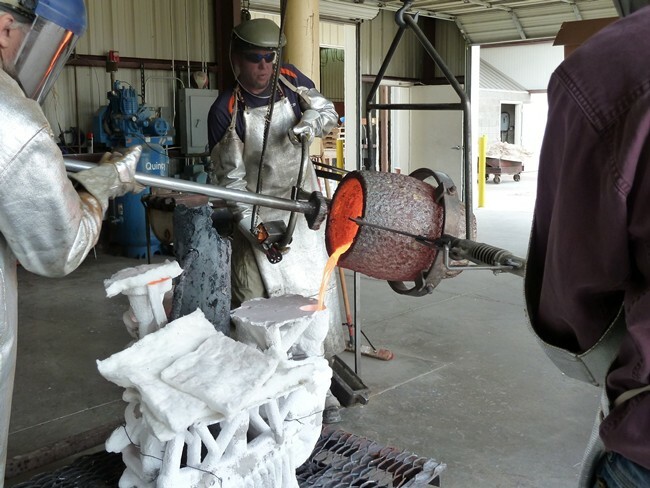 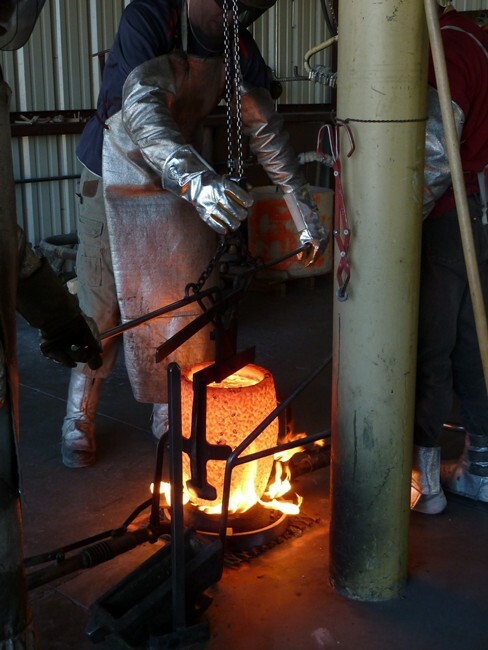 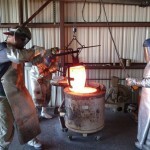 ronze ingots are melted and heated to a temperature of 2000°F. 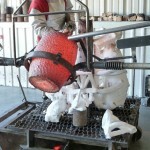 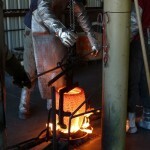 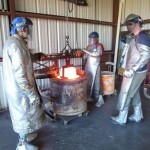 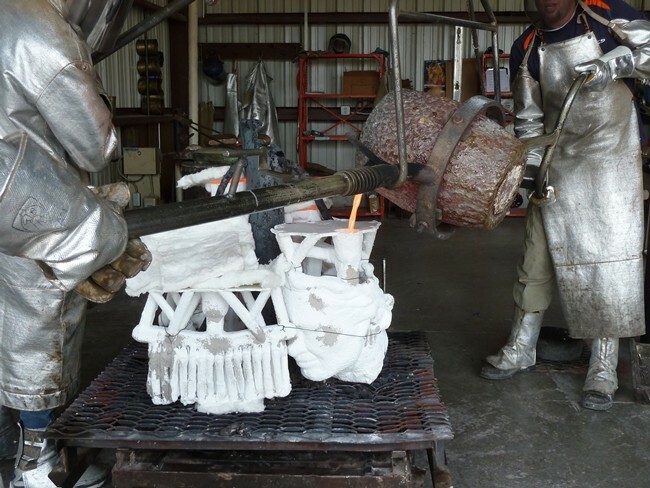 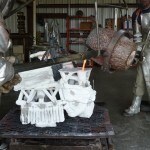 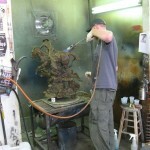 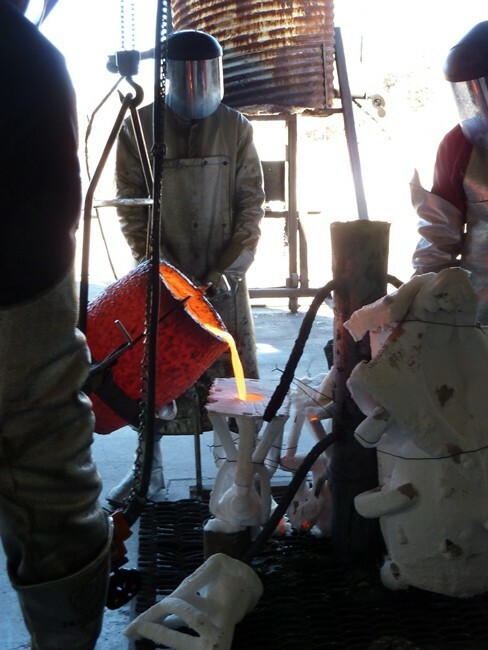 The molten bronze is poured into the ceramic shells. 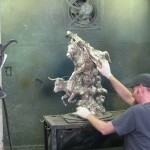 Once cool the ceramic shell is removed from the bronze using a hammer and chisel. 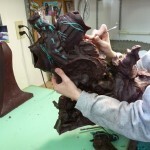 The shell also has to be removed from the inside of the bronze casting. 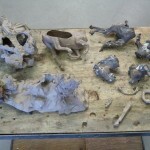 Pieces are cleaned up and then assembled by welding the pieces together. 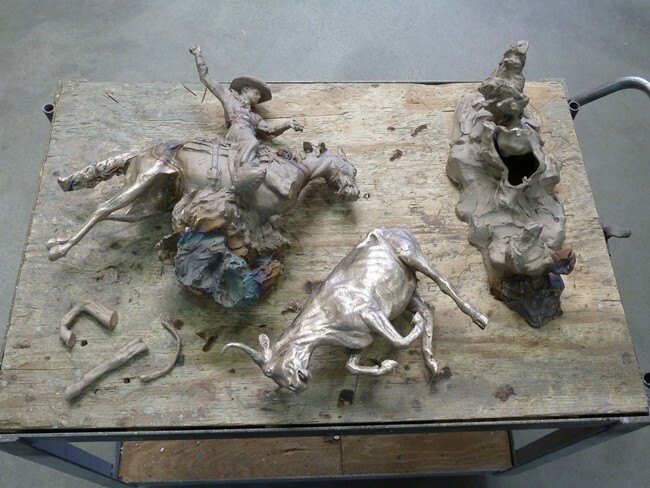 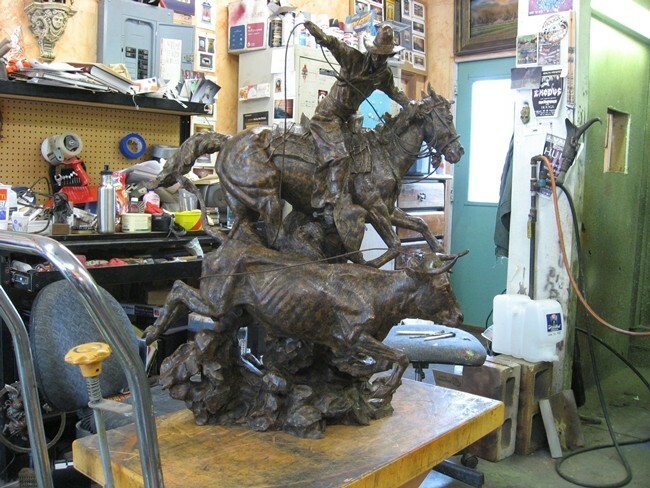 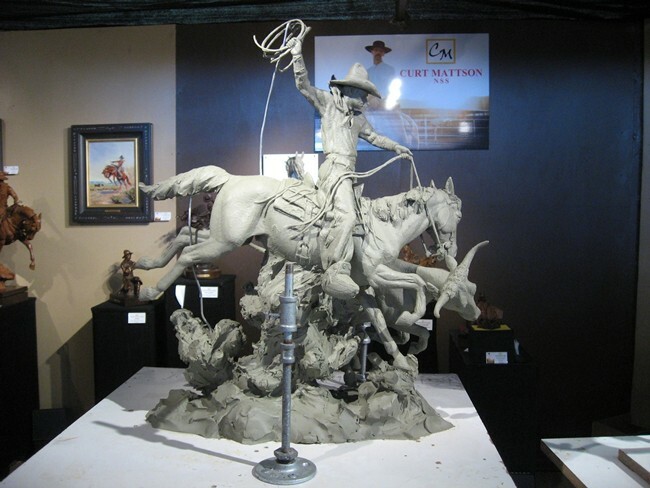 Metal chasing involves removing anything the artist did not originally sculpt and putting the piece together to look like the original clay. 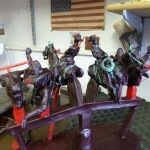 extures that were lost are added back in and any ropes and reins are applied. 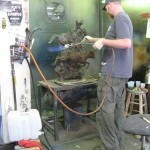 The piece is then sandblasted. 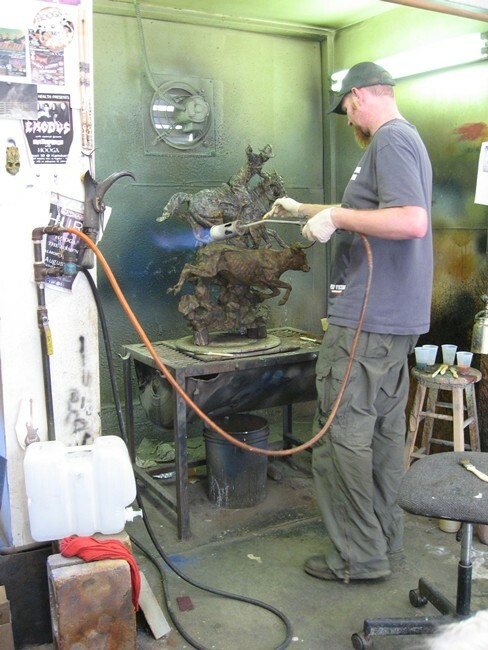 The first step in the patina process is to polish the piece. 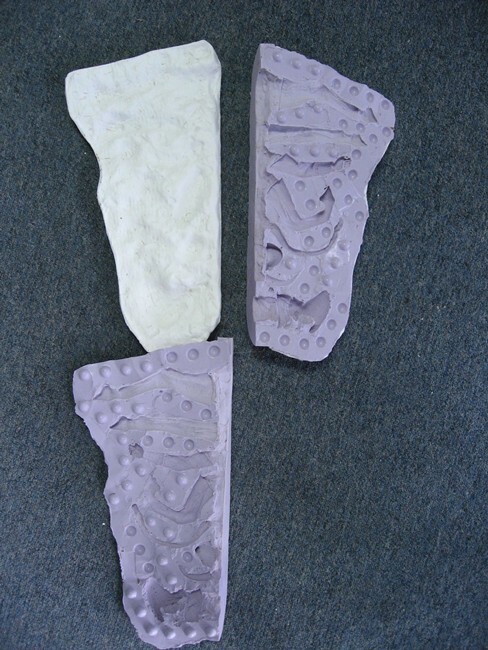 Different pads are used for this depending on the look the artist wants. 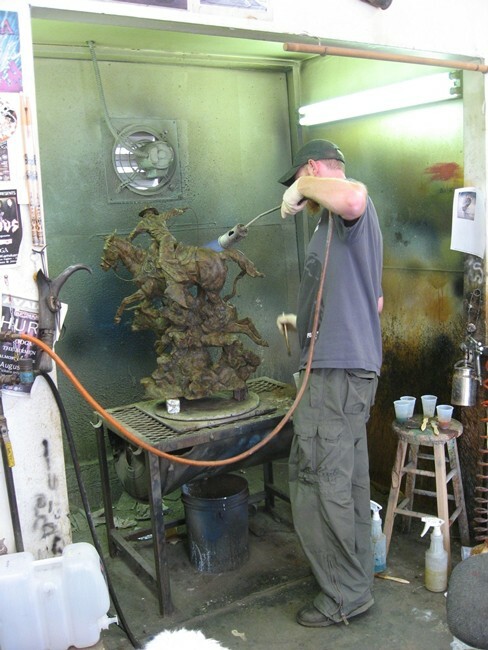 Heat and chemicals are applied in layers to create the patina. 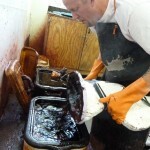 The order and type of chemicals used will vary depending on the color you want. 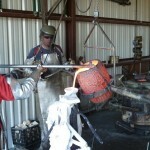 As well the amount of heat will vary. 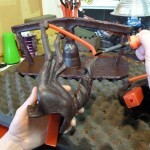 Hand stippling or spraying with an air brush are different methods used to create different looks. 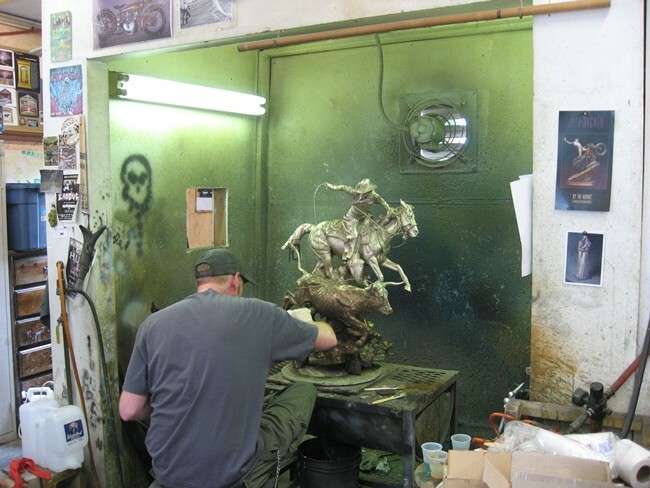 The final step for the patina is to apply a wax or lacquer to seal the piece.